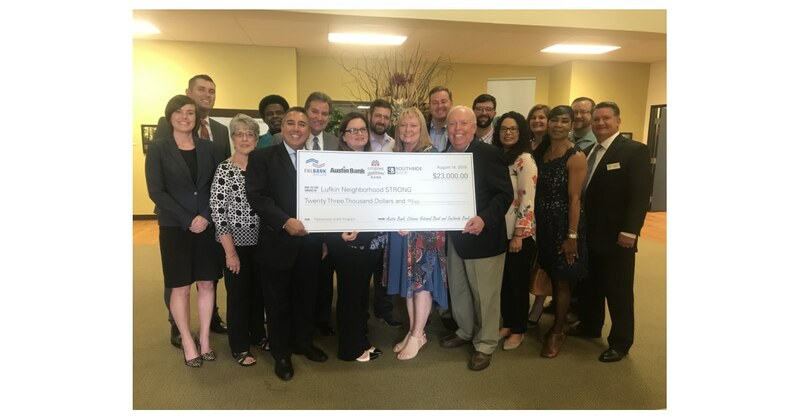 LUFKIN, Texas–(BUSINESS WIRE)–A Lufkin, Texas, nonprofit that assists homeowners in updating and rehabbing their homes got a boost yesterday with a $23,000 Partnership Grant Program (PGP) award from Austin Bank, Southside Bank, Citizens National Bank and the Federal Home Loan Bank of Dallas (FHLB Dallas). Neighborhood STRONG partners with local foundations, charities and corporations as well as city, state and federal agencies to assist homeowners of Wards 1 and 2 in the city of Lufkin with enhancing and/or renovating their properties. The organization will use the PGP funds to help with administrative costs. Citizens National Bank’s Senior Vice President and Central Regional Manager Jon Moore also emphasizes the value of the PGP. Austin Bank CRA Officer Debbie Braune said the bank’s community has benefited from the PGP. “We really appreciate the partnership aspect of the PGP because it opens the door for Austin Bank to positively affect the community,” said Ms. Braune. FHLB Dallas Vice President and Affordable Housing Program Manager Bruce Hatton said the PGP was designed to strengthen partnerships. Neighborhood STRONG’s Dr. Lawrence said the nonprofit needs grants from programs like the PGP to operate sufficiently. To learn more about the PGP or other Community Investment programs from FHLB Dallas, visit fhlb.com/community. Austin Bank’s lengthy legacy is the foundation of its philosophy to provide the financial stability and trust that contributes to the growth and prosperity of the communities it serves. With 32 locations in 23 cities and 11 counties, Austin Bank is a trusted financial source for the families and businesses it serves in East Texas. Southside Bancshares, Inc., the holding company for Southside Bank, is headquartered in Tyler, Texas. With approximately $6.37 billion in assets, Southside Bank operates 59 banking facilities in East, North, Central Texas and Southeast Texas. The bank also operates a network of 84 local ATMs/ITMs, and is affiliated with more than 55,000 foreign ATMs worldwide. Citizens National Bank was established in 1930 at the height of the Great Depression. With their recent acquisition of Union State Bank, they are now a $2.2 billion community bank that serves East and Central Texas with a combined network of 36 conveniently located branches. CNB also has trust assets under management of $650 million. Throughout its existence, CNB has remained committed to providing excellent personal service with the latest in banking technology. Citizens National Bank can be found online at CNBTexas.com.